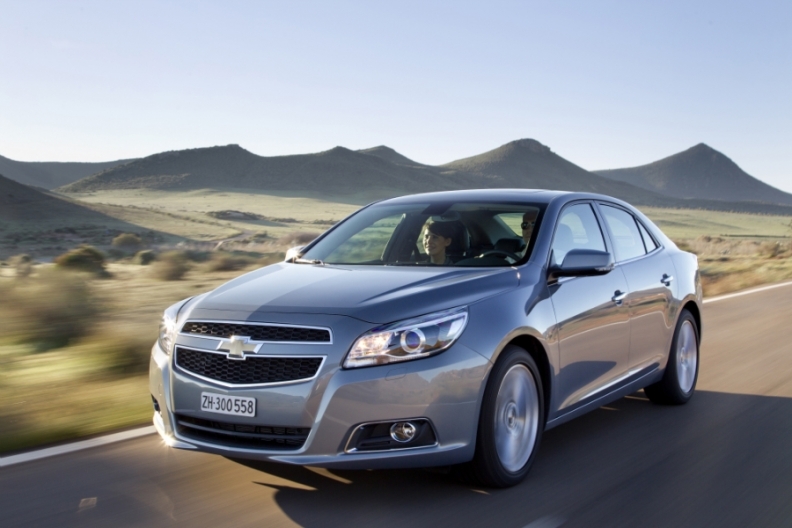 Chevrolet says the Malibu's 'powerful and elegant' styling will help attract customers to the brand in Europe. LONDON -- Chevrolet is rolling out the Malibu sedan in Europe as the brand's flagship as the General Motors Co. brand seeks to expand its product offerings in the region beyond low-priced small and minicars. The midsized Malibu will arrive is showrooms in Germany in July with prices starting at 29,990 euros ($37,395). It will be offered with a 167hp, 2.4-liter gasoline or 160hp, 2-0 liter diesel engine. The sedan fills the gap in Europe left by the Epica, but it won't be a big seller for Chevrolet. "It's considered a niche model," said a Chevrolet spokeswoman. The Malibu is based on General Motors Co.'s Epsilon II platform that also underpins the Opel/Vauxhall Insignia. In Germany, the Malibu costs 500 less than the equivalent Insignia with the same diesel engine, but the Malibu has much a higher specification, according to Chevrolet. Standard equipment confirmed for the German models includes leather seats and keyless entry for the higher spec gasoline version, and touchscreen satellite navigation for the diesel model. The Malibu is already on sale in Austria and Switzerland and will roll out in other markets in the coming months. Chevrolet's best-selling cars in Europe are the Spark minicar and Aveo subcompact. The brand has added models such as the Cruze hatchback and Orlando minivan as it seeks to double sales in the region, including Russia and Turkey, to 1 million by 2016. "We're trying to establish the brand in every market sector," said the spokeswoman. At the Paris auto show in September, the brand will debut a subcompact SUV called the Traxx. In the first four months, Chevrolet sold almost 67,000 cars in the 27 European Union countries, up 14 percent from the same period a year before, giving the brand a 1.5 market share, according data from industry association ACEA.